ICIPIA was founded in 2010 with the aim of bringing global-class intangible asset management services to SME businesses and others who, for whatever reason, have not had access to top-tier support in the acquisition, management and exploitation of intangible assets. We firmly believe that all businesses should be able to manage all the assets at their disposal to their advantage and our role is to help with that. Whether a small university spin-out or a social economy business; whether involved in technology development or product sales or service delivery; financed or financing we have the range of specialist support that you need, priced to suit your pocket. 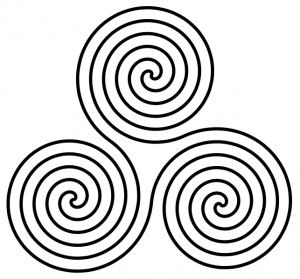 The triskele dates at least from neolitihic times, yet is still widely used today, in many different forms. The ancient version chosen by ICIPIA reflects our belief in the timeless values some say it represents. The three elements of intellectual capital, intellectual property and intellectual assets are endlessly intertwined and interdependent yet clearly distinguishable, each with its own particular place and role. Let ICIPIA help you get the most out of this complex and ever-changing world.